Much like you see an optometrist for your eyes and a dentist for your teeth, you should seek care from a Specialist for your feet. 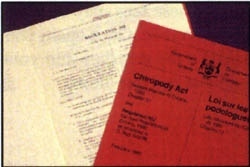 Chiropody (one of 26 regulated health professions in Ontario) is a branch of medical science that involves the assessment, treatment and management of foot and lower limb disorders: this involves the management of a wide variety of disorders, injuries and local manifestations of systemic conditions. Foot deformities, infections not only limit your mobility, but can detrimentally affect your health and quality of life. The Practice of Chiropody and Podiatry is defined by the Chiropody Act, 1991 "is the assessment of the foot and the treatment and prevention of disease or disorders and dysfunction of the foot by therapeutic, orthotic or palliative means". Practitioners in this field are known as Chiropodists and are authorized to presribe oral drugs, perform Podiatric soft tissue surgery and administer by injection into the foot medication and administer, by inhalation a substance designated by law. Chiropodists are recognized by the initials D.Ch. after their name. Podiatrists and Chiropodists are the only regulated foot professionals educated exclusively in Podiatric Medicine, the assessment, treatment, management and prevention of foot disorders. As primary care providers, capable of independant clinical practice a physician referral is not required. Chiropodists undergo extensive training in general Medical sciences with a focus in Podiatric Medicine. As part of there training, clinical experience through Hospital internships is also required. Today, a minimum of 7 to 8 years of post secondary education is required to sit the final provincial board exams, before finally beginning to practice.